Dear all Gurkha Brigade Association friends, please find below the link to all new and improved online version of Parbate. HRH Prince Harry’s visit to Nepal. 2 RGR raising the flag in Kabul. 1 RGR in Kenya on Ex ASKARI STORM. An update on the great work of the Gurkha Welfare Trust helping Nepal to recover from last year’s dreadful earthquakes. We hope you enjoy the accompanying music too! The May/June combined edition will be available within by mid-July. The Brigade of Gurkhas Media Team. 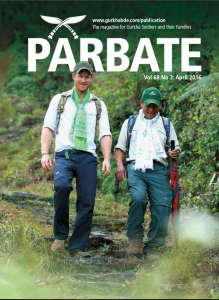 Click on the picture above to read the April 2016 edition of Parbate.